About American Legions Matthew Blount Post 555, Inc. The Post is relatively new, chartered in September 2014 with 30 charter members. Today the Post’s roster has grown to 215 members in the last 40 months and continues to grow each month. The Post exceeded its goal to have 100 members by December 31, 2015. Post has received 100% renewal recognition for each year 2015-2018. Matthew Blount Post 555 is a service and family oriented organization serving military troops, Veterans, youth and community. It encourages all our members to be involved in these programs and there are many opportunities to participate. The youth programs include Boys State, Girls State, Oratorical Scholarship Competition, American Legion Baseball and Junior Shooting Sports. The Post is involved in support of veterans & community programs in association with the Alabama National Cemetery, Blue Star Salute Foundation, City of Pelham, Pelham School System, Alabaster School System, Helena School System, Oak Mountain State Park, Employer Support of the Guard and Reserve (ESGR),University of Alabama Ice Hockey programmed the VA Medical Center to name a few. The Post has a non-profit 501(c)19 status in addition to 501(c)3 making all donations tax deductible. The Post is fortunate to have the support of the City of Pelham which provides a meeting place at the Pelham Senior Center. It provides ample space to have Post meetings, Post related and family events, Auxiliary, Riders and SAL meetings. The facility serves the Post well in carrying out our mission. 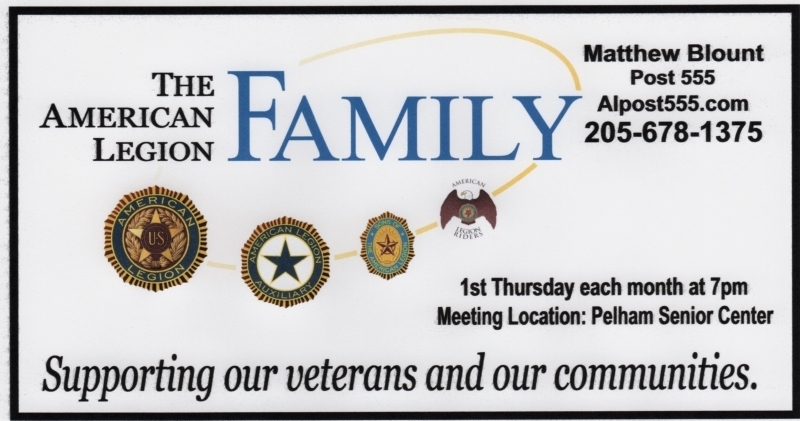 Post monthly meetings are held on the first Thursday of the month.at the Pelham Senior Center 50 Racquet Club Parkway Pelham, AL 35124 Fellowship with a meal begins at 6:15 pm- Meeting at 7:00 pm The Legion Riders squadron is eighteen strong and is very active in charity Rides that support Veterans, youth and community. There is a close connection with both the Legion and the Sons Squadron. They have a good relationship with Heart of Dixie Harley Davidson in Pelham . The Riders usually meet on the second Thursday of the month and at the monthly Post meetings. The Auxiliary has been established with the legionnaires to encourage female family members of the Post members to join the unit. They meet at the Post facility during the Post meetings. Renewal rate was 100% for 2017. American Legion Family includes The Sons of American Legion. The 2019 membership is thirty one members and continues to grow in numbers. They have reached their goal of 100% renewal for every year in existence. The squadron has established an annual event for each memorial Day to place U.S. Flags on all Veteran gravesites at the Pelham Cemetery with local youth organizations, City of Pelham and the community. Post 555 maintains both a website www.alpost555.com and Facebook Page www.facebook.com/alpost555. The Triple Nickel Newsletter is published monthly. Legion information, articles on previous projects and events and information on future activities are included. Newsletter and public media articles are also available on the Post's website www.alpost.com under the Publication tab. Post 555 supports the American Legion Flag Rewards program that is in conjunction with the Flag Replacement Program conducted by the Post Flag Team. Flag Detail and team conducts a formal flag replacement ceremony for businesses and community organizations if the new flag is purchased through the Rewards Program. The program promotes both The American Legion, Matthew Blount Post 555 and the community while creating sales for the Rewards Program. Other Post programs & annual events include July 4th, Veterans Day Veteran recognition, POW/MIA Ceremony, Military Appreciation Night, Veterans Recognition, Memorial Day (cannon crews), Military Deployment Support, and the VA Medical Center Christmas Gift Caravan American Legion, Matthew Blount Post 555 Working to promote citizenship and patriotism in our community. PROVIDE support to veterans; PROMOTE programs that benefit the community and its youth; PRESERVE the memory of those who made the ultimate sacrifice for freedom.